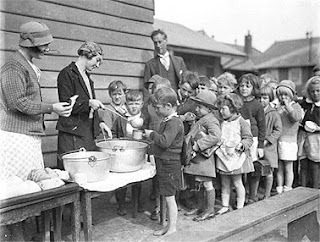 Children line up for free soup and bread during the Depression. At 8:50 every Wednesday morning, people bundled against the cold and burdened by their belongings form two lines along Fourth Street. One line is a group of neighborhood children cocooned in their coats and carrying backpacks heavy with homework. The other is made up of adults standing outside a movie theater-turned-mega-church. “What are they waiting for?” my daughter asked. To help cash-strapped states deal with the needy, Congress is considering subsidizing the welfare rolls. The economic stimulus bills pending in Congress would provide matching grants to states with increased caseloads. While politicians debate and bureaucrats react, more hungry people are lining up on Fourth Street. Outside the doors of Sparks Christian Fellowship, more than 100 people gather for their two grocery bags of non-perishable food they’re eligible to receive six times a year. Across the street, Greenbrae Elementary School also gives away food. More than two-thirds of the students receive free lunches, and some of those children eat breakfast and dinner there, too. These are today’s soup lines, and they’re in my neighborhood.